Dress with dynamic style the right way. Don't just put on an ordinary dress shirt. 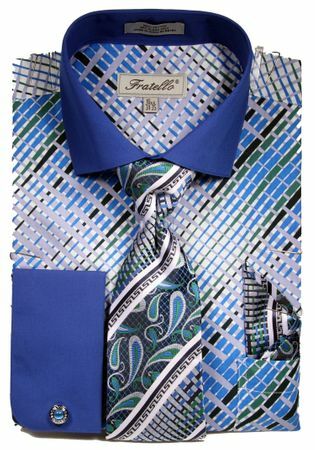 Make a Statement with dress shirt and tie sets by Fratello. Fratello specializes in head turning dress shirt and tie sets for the man who loves making a style statement when he wears his shirt and tie sets. Mens french cuff dress shirts by Fratello have head turning style. This blue dress shirt and tie set features a diagonal pattern design on the body and solid blue french cuffs and a spread collar made of 100% cotton.